I haven't been reloading too awfully long so I am being very careful. I am having issues with the cartridge oal being too long for my rifle. I inherited a remington 600 6mm, a Lyman spartan press, dies for the 6mm, and various other reloading equipment. Along with all that I also have a pretty good supply of 75 gr. sierra hp's that I have been loading up for practice. I have Lee's Modern Reloading book and a Lyman reloading manual. The overall length listed of 2.825 seems to be way too long. Lee lists the oal using IMR4320 at 2.740 and this is even too long. The bolt is tough to close and after firing the case head shows rub marks where it is hitting the bolt. I have not made it past starting loads because I am afraid of increased pressures due to the bullet being pressed in. I have tried seating the bullet a thoundth or so shorter but once again I am afraid to move it in too much. I am using IMR4320 and H4831sc with cci large rifle primers. I have tried Remington factory loads and they fit fine and I have measured the oal on them and there is only a difference of around a thousandth or two. I have also seated a bullet in a dummy round and marked it with black marker and I can see faint marks from what I assume is the rifling. I will soon be working up a deer load using a 90-100 grain bullet and since they will be longer I am worried about this being even more of an issue. Any thoughts? What am I missing? What you can do is again make up another dummy round *no-primer,, no-crimp) and chamber it slowly. Then extract the shell and measure c.o.l. as this will be your maximum c.o.l for that gun. You did say you were using Rem factory loads and loaded fine, also remember, a few thousands of an inch or 2 can lead to not good things. I think Omini is on the right track. When I start loading for a new cartridge like that I first check to see if I'm sizing the brass enough. Start with just a case and the sizing die set a little long. Size a case then check its fit in your chamber. Adjust and check again until you get the bolt to close easily. Don't worry about the OAL of the loaded cartridge until you get that part right. You mentioned that you are loading hollow points, the OAL listed in most reloading manuals is based on soft points. Hollow points usually have a significantly shorter OAL, that may be your problem. I checked the data and both were for 75 gr. hollow points. The cases by themselves chambered fine. I did have some success making another dummy round and chambering it letting the rifling push it back into the case. The overall length was 2.744 which is under the 2.825 recommended in both manuals for the H4831. (actually the Lyman manual calls for 2.825 for all powders) So now I know that the oal must be 2.744 or under...what am I supposed to do with data that calls for a longer oal? I understand that even slight changes could increase pressures making even starting loads a potential hazard...so what can I do? I have another question about bullet selection. I have the mind set that the bigger the bullet the better the performance on deer. (at least with the 6mm, i understand that in a larger caliber you don't need the biggest offered in that caliber) I like the performance I have seen from the Barnes x bullets but they only make up to 85 gr. for 6mm. Nosler and so on make 100 gr. accubonds and partitions and some 95 gr. e-tips that seem to be knock-offs of x-bullets. Am I letting a few grains get to me more than it should? Is the performance of the x-bullet worth losing 10 or 15 grains? I grew up in shotgun only deer hunting country so I am used to hitting them in the shoulder and they go down instantly. I know that with a 6mm I can't expect that kind of massive shock, but I want something that if my nephew hits a shoulder blade or rib or something more substantial it will continue on its way. Any suggestions? You're smart to be careful. A small change in seating depth makes a big difference in a pistol case but less so in a rifle case like the 6mm. Think of it as a change in volume of the combustion chamber. Since you know your max OAL now I'd just begin with the "starting loads" and carefully adjust up until you get the best accuracy. I have not checked the Sierra manual because I doubt I will ever buy Sierra bullets after I use up these, so I can't justify buying it. They are leftovers my Dad had from sometime in the early 70's. He bought them then never used them, so I am using them as learning tools before I get into buying bullets I will use for hunting. I would say they are a bit blunt compared to others I have seen. I have been reloading for over 45 years but this doesn't mean I know everything just means I have had a lot of benifit from others smarter than me. I use Stoney Point OAL now know as the Hornady Lock N Load OAL tool to measure bullet ogive measurement and ultimately the over all length. Since you probably don't have one you can use a spent round. Screw in your depriming pin to punch out the primer before the neck sizing portion of the die engages the neck of the case. Remember to lube your case well to prevent sticking a case in the die. (Also chamfering the inside of the neck of the case is highly recomended.) Secondly screw the decapping pin back out and also screw out the die so as not to touch the neck of the case. "The rest of the process is to accomplish making a case neck just right as to not allow the bullet to slide through the neck as it will after the round is fired but will allow you to push the bullet into the neck fairly easliy with using only your fingers." It is a trial and error process now but lower your handle to your press to raise the case as far up as the press arm will go. Now screw the die down just to touch the top of the neck. Now lower dies slightly by rotating the dies very very very slowly. Press the case into the die and then check the neck of the case to see if the bullet drops through or if the neck is slightly restricting entry of the bullet. Cont to screw in die until you have just barely resized the edge of the neck of the case to let you push the bullet into the neck with your fingers easily but not fall through. This is the PRIME OBJECTIVE. Now you have a case that you can use to measure different bullets maxium seating depth (just touching the lands but not into). Some people do not understand that every bullet has a different ogive and touches the lands at different seating depths so for your safety and anyone shooting your reloads please practice safety and measure all bullets and I DO NOT load bullets touching the lands as this DOES increase pressure factors which can be danger to your gun and to the shooter. I prefer to load within 3 to 5 thousands or futher away from the lands as the rifle accuracy dictates. As to your second question: If you are truely shooting a Remington 600 stamped as a 6MM it is a 1 in 9 twist riflings in the barrel and you can shoot any bullet designs for the 6MM. If the barrel is stammped .244 it is a 1 in 12 twist barrel and 90 grain is the max gr bullet recommended for the rifle as the slower twist is not designed to stabilize the heavier bullets. I personally shot my first while tail back in 1964 with a Remington 700 BDL in 6MM. It was my Dads rifle which we also reloaded for. I prefer to use the Nosler Partition 100gr for my 6MM or .243 Win. I have never lost a deer nor had one go very far. 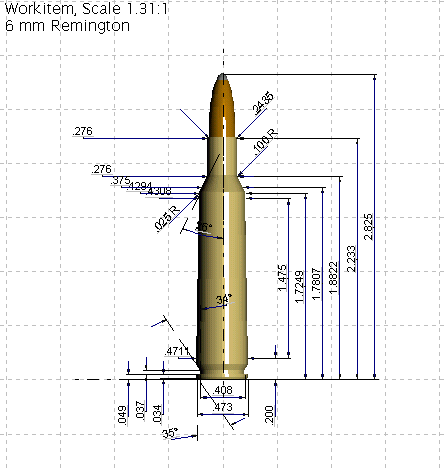 As for reloads I recomend starting with the minium load from your book and increase in .25gr increments to the maximum looking at each case neck, lower outside case, base and primer for splits, swelling, primer flattening as welll as base flattening where printing is flattened and also extractor markings. Sometimes you have to change powders but H-4831SC is and have been a very faithful propellant for me and a lot of other loaders. Good luck and pray that you observe safety in all your reloading venture. Have a Blessed Day! Sorry I noticed where I needed to add a comment on the neck sizing that is I'm sure is not clear. Where it states: "Now lower dies slightly by rotating the dies very very very slowly." Should have stated to lower the case slightly before lowering the dies each time until the bullet will not fall through. Hope this is a little clearer. If not just holler. Thanks for the info I will give it a try tomorrow. It is a 6mm, I have read all I can about the caliber. The information varies as to what the twist rate is. I ran a tight fitting patch down the barrel and marked the rod and got around 10-1/2 twist rate, but the rod could have slipped on me. So far I am not happy with the H4831sc. The cylindrical powder fills the case very quickly and being new to reloading I don't wish to mess with compressed loads, so my options are limited to very light loads. I see that you are in Rowlett. I used to work in the Verizon central offices from Rowlett to Keller and everything in between. To tell the truth I couldn't tell you a thing about Rowlett since we worked midnights, but I did like the drive out that way. We were based in Lewisville so I know more about that area, mostly that I did not like the area. Ha ha. heres my 2 cent worth. a family friend had a bolt action .270 that would only chamber norma factory ammo. it had a very short throat and other loads would hit the rifling. the 87grn loads are considered dynamite on deer in the .243.
for hunting a load that is easy to chamber is VERY important to me. I set my dies up using a factory load to give me a start point for seating depth. you could try the same if your factory load chambers fine try setting your bullet seating depth with that and try chambering the new load. What brand is your rifle mate? Are the cases you are using new or used? If used, how old are they, how many loadings have they had and were they previously fired in this rifle? It sounds to me like the shoulder is the culprit, or wrong...especially since factory loads fit ok. Do you full length resize or only neck size? OAL is not the only measurement that is critical. The length of the case, the measurement from base to shoulder and the length of the neck must also be considered. Something else I would consider doing is measuring (or making a cast of) the chamber. Maybe a previous owner has rechambered it for something similar or has some work done that has resulted in the shortening of the chamber. I would be doing a thorough measurement of the cases prior to resizing, then redo the measurements after resizing...this may bring something to light. I would also be revisiting the setup of your resizing and bullet seat/crimping dies and ensure that they are set correctly. Other than what the other guys have said, I can't really think of anything else that could cause this problem. It's a Remington 600. The cases alone fit in the chamber fine, so I don't believe it is incorrect shoulder angle, etc. The rifle was my Dad's, he bought it sometime in the late 60's early 70's. He shot it some off and on until his death two years ago, always with factory loads with no issues. Some of the cases have been reloaded maybe twice, but then I have others that were factory loads I had bought so they had only been fired once. Being new to it and understanding that things can get dangerous real quick I measure everything over and over. I have not gone so far as to measure each bullet before loading, but I may need to. The standard 2.825 oal listed is definately too long for this rifle. I full length resize, maybe I should only neck size? After each resizing I measure and cut and chamfer as needed. OK Chris...sounds to me like you are doing everything right mate. It would be interesting to measure the OAL of a factory round that fits the chamber...then compare it to one of your handloaded rounds. There is obviously some difference between the two types of rounds that will show. Re-reading over your problem reminded me of a very similar problem I once encountered. I remember some years back I had hell's own problems getting some 30.30 rounds to chamber in my Model 94 lever gun. I was tearing my hair out because I knew that I had not changed anything, including my reloading process. Quite by accident I discovered the problem. I felt a very slight "ridge" at the point where the body of the case became the shoulder. A few measurements confirmed that somehow during the reloading process the shoulder was being ever so slightly crushed causing a "ridge" to bulge where the shoulder started. I re-adjusted both of my sizing dies (FLS and Neck) and the bullet seating/crimp die and it solved the problem. To this day I am not certain which die was at fault, but I have now set my sizing dies to size only about 3/4 of the way down the neck, and the crimp to be no more than is needed to hold the bullet in place. A LEE Factory Crimp die will remove any chance of the crimp process being a problem. Nothing else I can think of mate I'm sorry, but I'll be following the thread to see what the problem turns out to be so that I learn something new.